For our camping trip a couple of weeks ago, I made some chocolate cheerio pops - for the grownups. But this little one's mother decided to let her have a go at it too. I think she liked the sprinkles best of all. It's a little hard to bite anything without teeth. She was the cutest little camper I ever saw - that hat, and a pink fleece vest. After turning in two big assignments, I rewarded myself with a little time on Picnik. In honour of the Space Shuttle's last flight, they have some Space textures to try out. This is one of them. I'm joining Beverly's Pink Saturday for the first time. That is a very pretty flower, but nothing can top that precious child. Beautiful...love sweet girl! And love the space texture.... I need to go get that! 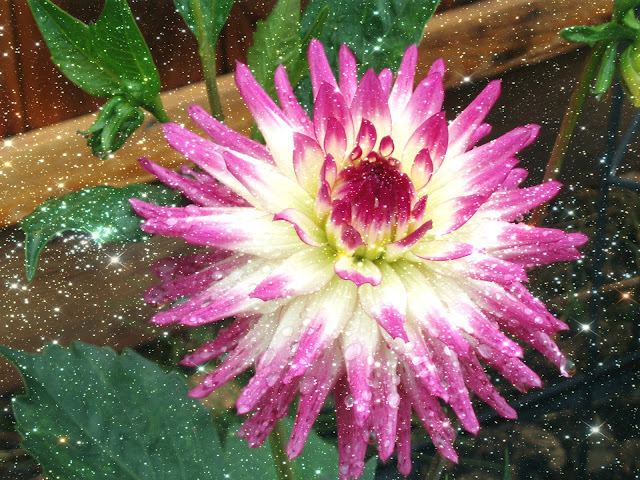 When I was growing up, my father showed Dalia's at all of the major events...your flower and the totally fun effects brought back memories and made me smile!! Thank you! Good job with Picnik! Beautiful. And a very sweet camper in pink...and all grown up already! It's important to dress appropriately for outdoor activity - one can never start too young. She's lovely in pink! Of all the pinks I've seen today she is the loveliest! She's a sweetie! And I love what you did with the textures. Oh my goodness, she is the cutest little pink girl, and that is the prettiest pink dahlia!! All smiles!